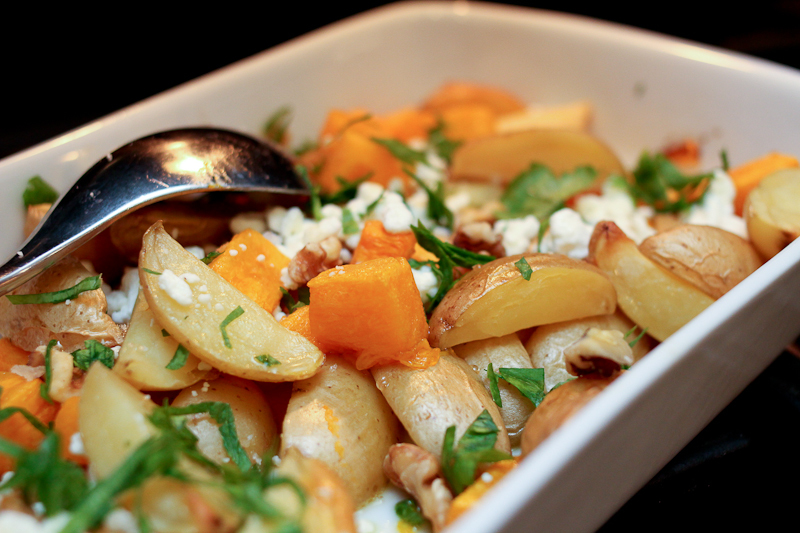 Fall is in the air – and it is time to add squash and pumpkin to your food. So simple, so colorful and so seasonal. Not to mention super good for you. An all time fall favorite. Peel and cut the vegetables into bite size pieces. Put in an oven proof dish, toss with a little olive oil and bake for 45-50 min. When baked sprinkle with walnuts, goat cheese and parsley. Season with salt & pepper. I like to drizzle just a bit of akacia honey on top. Add other root vegetables eg parsnips, turnips, sweet potatoes. Try another herb. This entry was posted in Salads & sides, Veggies only and tagged cooking, food, healthy food blog, kartofler med gedeost, potato, recipes, side dish, winter. Bookmark the permalink. I’ve been making this for my family a couple times a week. It’s a perfect winter side dish.